Scams and looters have denied people in Uttar Pradesh of gains from central government funds for development, Congress chief Sonia Gandhi said while attacking the Mayawati government here Sunday, as voting took place in 56 constituencies in the fourth phase of assembly elections. In her 20-minute-long speech at the Exhibition Ground in Aligarh, Gandhi said that the central government was giving huge amounts for development under various schemes, but due to "luterey aur ghotale" (looters and scamsters) people had not benefitted. 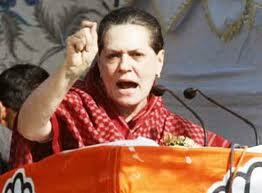 Sonia said urea had been provided for farmers by the central ministry but it was not reaching the people. She said Aligarh was a historical city which mirrored our composite culture. The Congress was committed to promoting this "tahzeeb". "We believe in taking all sections of society along the path of development but the backwards need special support therefore we have made new schemes for the poor and the underprivileged sections. Villages and rural areas are important for development of the country," she said.